Make your next eBook a bestseller with a professional design that catches the eye. Just like in a bookstore, an online buyer will browse through multiple eBooks and will probably judge them by their covers, so for this reason you need to make a great first impression. 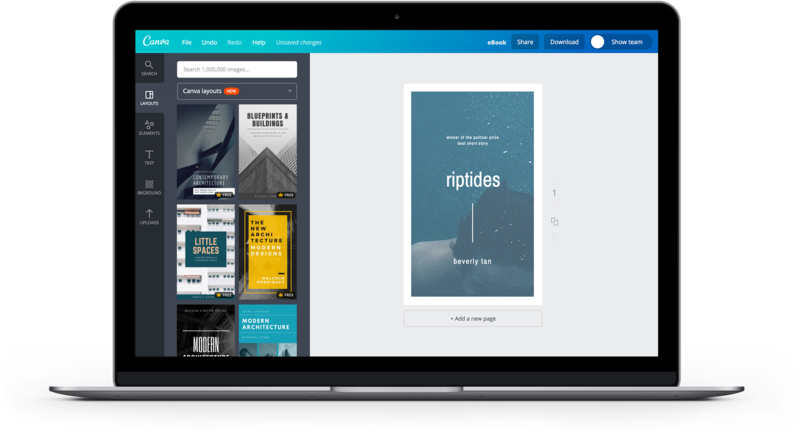 When you create an eBook in Canva, you can rest-assured that you’ll have access to the most eye-catching and brilliant designs so that you have the best chance of standing out. Readers might judge a book by its cover, but you’ll also want to make sure the design around what’s inside your eBook is completely up to scratch. Even if you feel more comfortable with words than design, Canva was created for design beginners. With an amazing library of templates and easy, drag-and-drop tools, you can create a professional looking eBook from front to back. Create a professionally designed eBook with a few simple steps. Create a new Canva account to get started with your own eBook designs. Customize the design of your eBook as much or as little as you like. Whether your eBook is for a work project or for your personal literary work of art, Canva has a template to suit your needs. The best part is, there’s no need to hire a graphic designer or pay for expensive and complicated software to get your eBook out there for the world to see. You see, even if you have zero design experience, you’ll be able to create a professional looking eBook that hits all the right notes with Canva. Each multi-page layout provides visual default elements, colors and fonts, so that you always start off on the right foot. And if you want to change any colors or elements to make your eBook feel more like ‘you’ then you can! It’s easy. From your eBook cover to your very back page, let’s face it, every page counts. That’s why you’ll want to make sure that every inch of your eBook is cohesive, sleek and visually engaging. Whether it’s an icon, vector or pull-quote, there’s so much versatility with Canva. If your eBook needs to adhere to a certain brand palette just enter the hex code of the colors you need to use to customize design elements. If it’s images that you need then you can choose from an enormous library of professional stock photos. And if you fancy yourself a bit of an illustrator, you can even upload your own drawings to give your eBook that artistic and personal touch. Best of all, uploading and using your own images is completely free! Every design created in Canva is saved ‘in the cloud’ making it super simple for users to work with a team. So if your eBook is a collaborative affair, you can give your team either editing or viewing access. All you need to do is hit the ‘share’ button and send them a link to either edit or view by ticking a checkbox. The other great part is that you can sign in at any time to access your designs across a range of devices including your computer, iPad, iPhone, and Android devices making it super simple to work on the go. Designing your eBook in Canva is free! Our library of layouts have been created by awesome designers, making it as simple for you as a few clicks to create a professional design. If you use your own images in your design, the entire process will be free. Can I print my eBook design? If you’ve used paid elements from Canva’s library you can go ahead with a print run of up to 2000 copies. If you’re creating an ebook for purely online distribution, you can share and sell it as many times as you like.